Bay Area home sales dipped by 8 percent year over year in October; however, the 19 percent increase from September was the highest monthly gain between September and October going back to 1990. Santa Clara County and East Bay counties continued to lead the sales declines, while San Francisco activity remained steady on an annual basis. Sales of higher-priced homes — $2 million-plus — rebounded notably, up by 24 percent from October 2017 following a September drop. Inventory grew by 21 percent year over year, with almost half of the increase — or more than 1,100 homes — priced below $1 million. Lower-priced inventory rose by 18 percent, the largest increase following 15 months of double-digit percent declines. Buyers of homes priced below $1 million are decidedly restrained, with the fewest homes selling for more than asking price since January 2017. There were more price reductions across the region and at all price ranges, with lower-priced homes posting the largest share of reductions in the past three years. With the housing market going through a transition, it is critical to decipher trends related to changes in buyer demand from those due to events that occurred after last year’s October Wine Country wildfires. 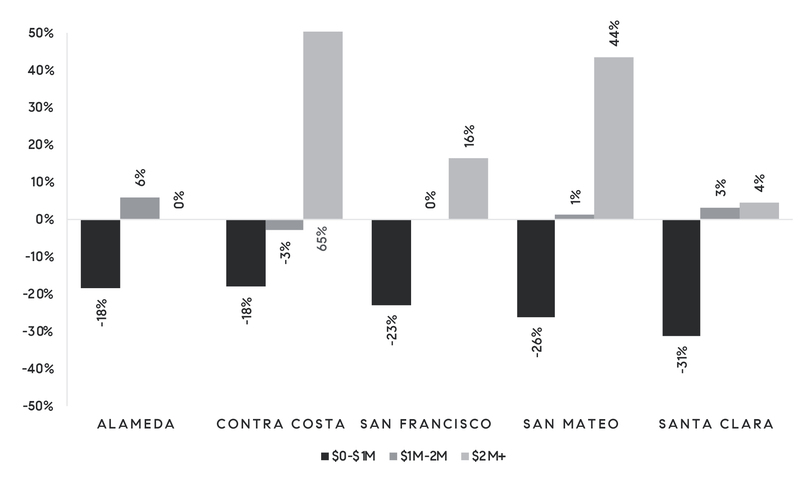 As a result, this analysis focuses on the Bay Area but excludes North Bay markets, which will be presented in a separate study later this month. While Bay Area home sales continued to decline on annual basis, October’s drop was much smaller than the decrease recorded in September. Also, with the monthly increase of 19 percent from September, it was the largest such gain between September and October since 1990. Long-term trends indicate that the change in sales from September to October has generally averaged less than 1 percent. 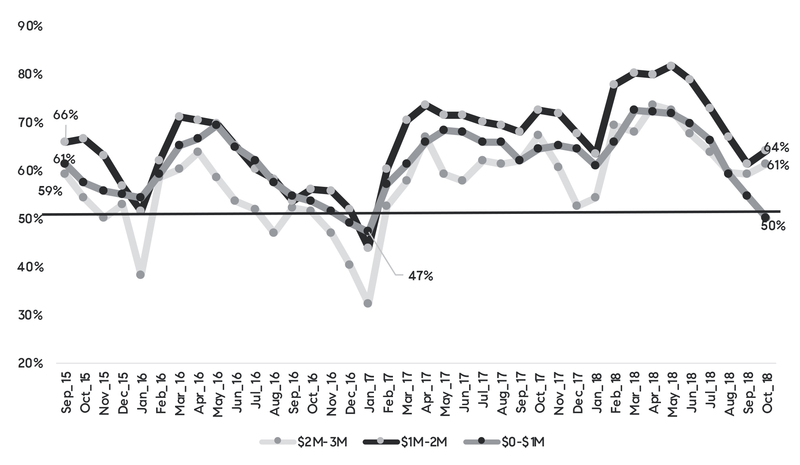 The only time that activity picked up substantially in October was the 16 percent increase recorded in 2012; however, that was the year when investors were rapidly absorbing distressed inventory. Thus, October 2018 activity is more considerable than a simple look at the numbers would suggest. Figure 1 illustrates the changes, with the first set of bars showing the September to October 2017 change, the second set showing the September to October 2018 change, and the last set showing the October year-over-year change. In other words, the month-over-month increase was much larger in 2018 than it was in 2017. This suggests that while buyer demand has waned, it has not faded as much as September numbers initially indicated. Declines were again dominated by the East Bay and Santa Clara County and much less so by smaller drops in San Francisco and San Mateo counties. In addition, sales of higher-priced homes — $2 million and up — rebounded following a decline in September. Figure 2 illustrates year-over-year home sales changes by price range. There is a stark difference in declines of homes priced below $1 million and a large increase in sales of homes priced above $2 million. 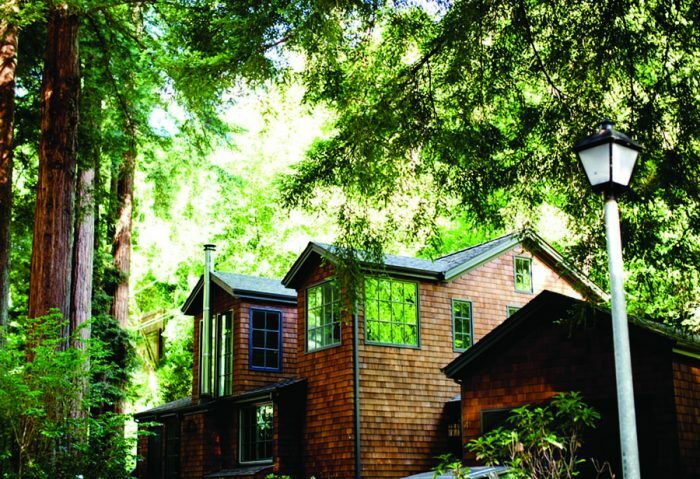 Homes priced between $1 million and $2 million have generally remained steady. The opposing differences suggest that the weakness in sales resulted from affordability constraints. In an earlier analysis, we noted that rapid mortgage rate hikes this summer considerably limited households’ budgets and abilities to afford homes in the Bay Area. Figure 3 summarizes October year-over-year and year-to-date home sales changes by price range. Again, with October’s bump, higher price ranges have maintained solid momentum in 2018. The weakness is in the most-affordable category, while homes priced between $1 million and $2 million are trending 18 percent above last year despite a smaller 2 percent increase in October. This price range may see further weakness in the coming months as homebuyers are more aware of the impact of higher mortgage rates and lower mortgage-interest and state- and local-tax deductions resulting from the reforms. Inventory continued to increase in October, rising by 21 percent from last year, with uneven gains across the region. With more than 2,500 more homes for sale across the five counties included in this analysis, almost 50 percent of the gain was due to more inventory in Santa Clara County, while East Bay counties added another 41 percent. 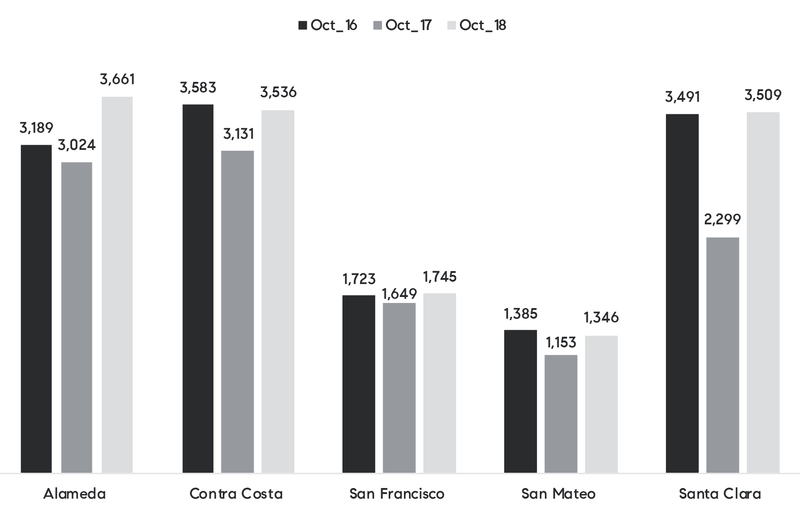 Figure 4 compares October inventory levels over the last three years and highlights that current levels fall in line with 2016 except for in Alameda County. In other words, while the current increase may appear startling compared with last year, supply is still in line with 2016 levels, which was already well below long-term averages. Also, half of the supply increase — more than 1,500 of the 3,000 additional homes for sale — was for properties priced below $1 million. Figure 5 summarizes changes in inventory by price range, with the last row displaying the increase from October 2017. The 18 percent gain for lower-priced inventory is a favorable reversal of a 15-month double-digit percent decline and one that homebuyers will welcome. 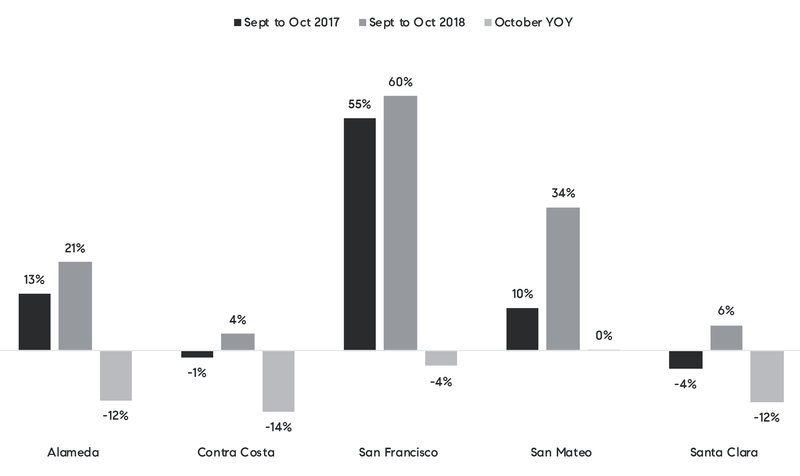 Also, an increase in lower-priced inventory was seen across most regions, except in San Mateo County. With affordability being the main concern, buyers have more options than they did last year. In addition to having more inventory to choose from, buyers now hold more bargaining power, which was reflected in the number homes that sold for premiums, particularly more affordable ones. Figure 6 illustrates the longer-term trend of buyer competition by price range dating back to September 2015. With 50 percent of homes selling for more than the asking price in October in the lowest price range, that point has now seen nearly the fewest overbids since the 47 percent recorded in January 2017. Higher price ranges have also registered declines, though not as notable. Figure 7 shows changes in the share of homes selling for more than asking price compared with last October. The largest drop-off in premiums was in Santa Clara County, where buyer fatigue started earlier in the year. Note, however, that higher price ranges are not consistently seeing reductions in bidding wars, with Alameda and Contra Costa County buyers still facing competition for homes priced higher than $2 million. And San Francisco, where seven in 10 homes commanded premiums, has not seen a decline in overbids compared with last October. Lastly, when examining the frequency of price reductions, the message remains the same. There were more reductions across Bay Area counties and price ranges, but the largest increase was for affordable homes, which saw the most reductions over the past three years at 28 percent. Higher price ranges, while also posting an increase in reductions, are still trending below the previous peak in the winter of 2016. To conclude, as discussed in a recent analysis, interest rates and price growth took a large bite out of already-constrained affordability, pushing many budget-conscious buyers out of the market. The improvement in inventory may invigorate some activity, but unfortunately, the housing market is now bearing the consequences of growing too much and too fast earlier in the year. 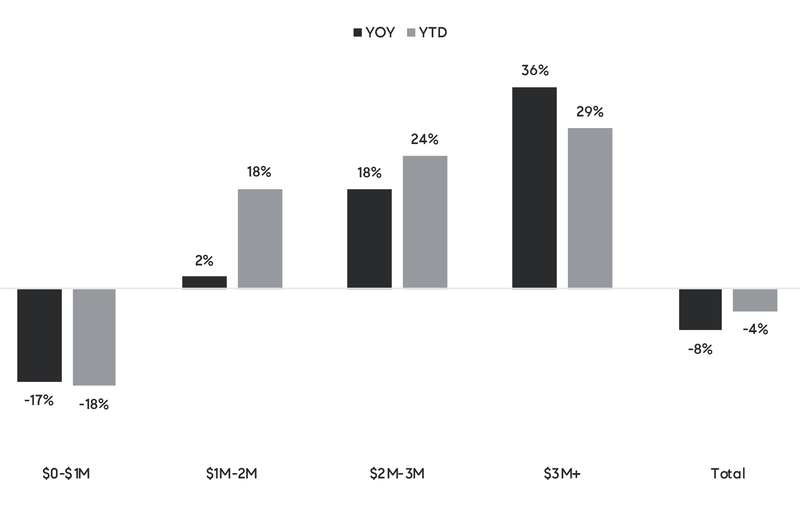 On other hand, it is encouraging to see that despite financial market volatility and the impacts on tech companies, buyers with bigger budgets are still encouraged and moving forward. Nevertheless, sellers are facing a tougher crowd and may need to adjust their own expectations.